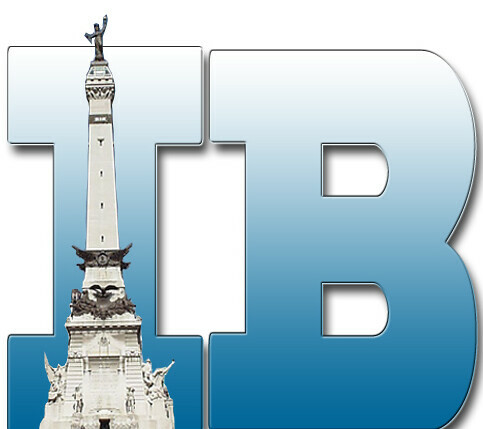 As a 20-something living in Indy, I decided to join this cool group called Indy Hub that advocates for Indy’s twenty-/thirty-somethings, and acts as a resource to help us learn about and become a part of the city. If you’ve read any of my blog posts, or any social media posts for that matter, (or heck, just by looking at my blog header photo) you can probably tell that I am passionate about agriculture and food. So when I heard that Indy Hub was putting on an event called “Raise Your IQ: Indiana Food” I knew I couldn’t miss it! Don Villwock, Indiana Farmer and President of Indiana Farm Bureau on new methods of agriculture and how they support a stronger economy and state for all of us. Clay Robinson, Founder of Sun King Brewing on building a new career through food. Dr. Lisa Harris, CEO and Medical Director of Wishard Health Services on envisioning the future of public health through food. Aster Bekele, Founder and Executive Director of Felege Hiywot Center on her journey of community development and youth empowerment through a tiny urban garden. The two panel members I listed to were Clay from Sun King, and Aster from the Felege Hiywot Center. I’ve heard of Sun King before, but who wants to pass up a free sample and be able to pick the brain of one of the most popular local breweries in the city? Not this girl! Clay Robinson discussing how Sun King utilizes Indiana ingredients in their local craft beer. He wants his beer to be known as “Indy’s local beer” that’s exclusive to the city and people come to Indy to buy it. And I love that philosophy! I know not everything can be kept local, but it boosts the economy and ups the hype about the cool things we’re doing in Indiana. Keep up the good work, Clay! DidYouKnow: Indiana’s popcorn crop is the second-largest in the country and Sun King used this as their inspiration for their Popcorn Pilsner that is crafted with 2 pounds of Indiana grown popcorn per keg! My second session was with Aster from the Felege Hiywot Center and I was very interested to learn more about this organization. Aster came here from Ethiopia and recognized that kids in her neighborhood weren’t appreciating everything they have here in the U.S. (education, resources, etc.) so she started the center to serve urban youth of Indianapolis, and teach them about gardening and environmental preservation as well as encourage them to embrace the virtues of community service. They have a really neat story so be sure to learn more about them on their website! Aster telling us about her journey when she moved to Indianapolis to attend college and how she came to start the Felege Hiywot Center. What I thought was so neat about her story was her passion for youth. And that is so true! I am passionate about teaching youth about their food and agriculture and it was refreshing to see her putting an emphasis on it. I was so inspired by Aster’s work that I might actually help volunteer there! And you can too! To end the night we heard from the panel and talked about what is exciting about Indiana food, sustainability, and how we can continue the conversation about the importance of knowledge about our food. 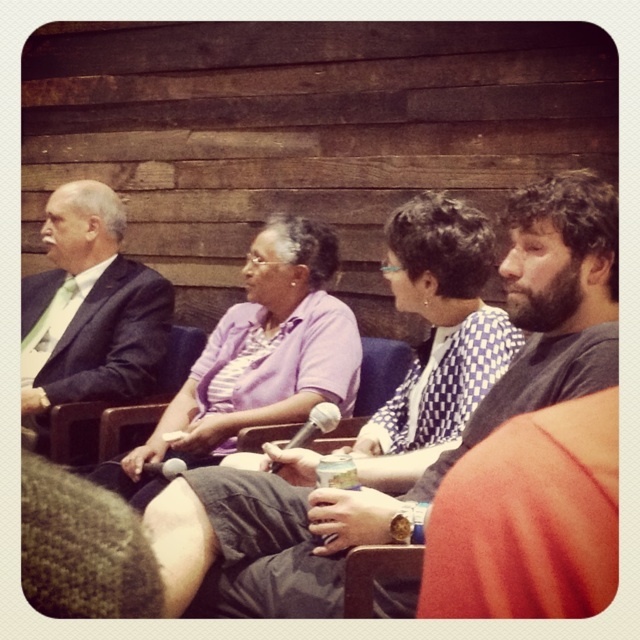 L-R: Don Villwock, Aster Bekele, Dr. Lisa Harris and Clay Robinson. Indiana Farm Bureau President and Indiana farmer, Don Villwock said that he is excited about the opportunities for young and smaller famers to get involved with the increase in the local food movement. As a farmer, he also emphasized the importance of sustainability. This was such a powerful quote to me because it shows that despite what some might think, farmers really do care about their land and the crops they grow. That is their livelihood and they eat the same things we do so they want to make sure to take care of their resources. My final take-a-way point of the night was from Dr. Lisa Harris about making time to actually gather around a table for a meal together. This really stuck with me because by being from a large family, this was one of the things I most valued about growing up. And I want to encourage everyone to make an effort to get back to cooking meals at home and eating at the dinner table. It sets a good example for your children and is such a good way to keep you connected to your food, and as a family. Overall this event was so much fun! There was a great turnout with people from many different professions around the city. I caught up with a few participants to see what they took away from the discussion. Click the link above to listen to physician Risheet Patel of Fishers and psychiatry resident Aimee Sirois share their take on learning more about happenings in Indiana food. 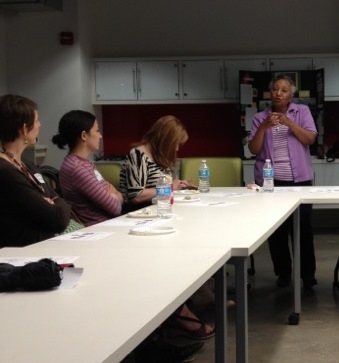 Thanks to everyone who came out to encourage the conversation about Indiana Food! 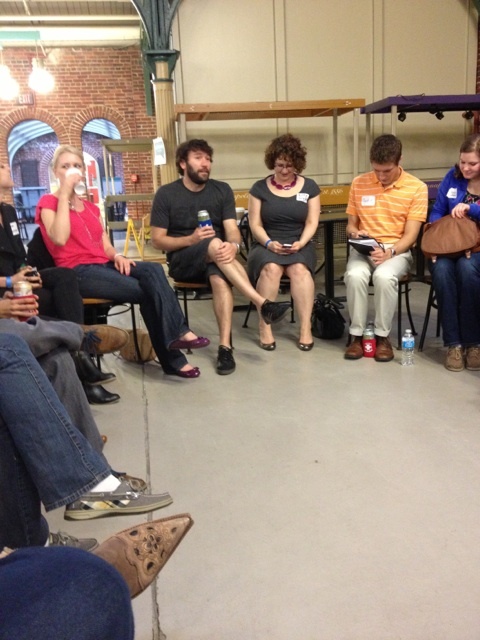 I can’t wait until the next IndyHub event! 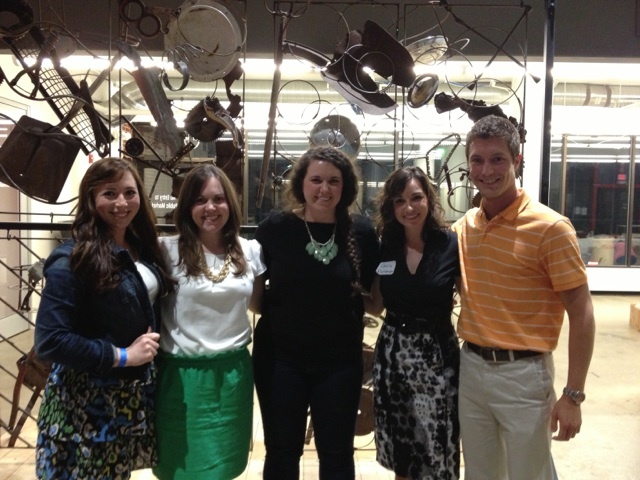 My fellow Marion County Farm Bureau Young Farmers who attended the event!